Following our article in the Antiques Trade Gazette here is some more information on who this fabulous Victorian Portrait Figure represent and why the Staffordshire Potters immortalised them in clay!! Exactly 150 years to the day, on 17 April 1860 an illegal bare-knuckle fight took place in a field at the back of the Ship Inn in Farnborough, Hampshire, on the Surrey-Hampshire border. Prize fighting at the time being illegal. John Heenan (USA) v Tom Sayers (UK) the fight was in essence a world heavyweight fight. The reason for the location was that in the event of the Hampshire Constabulary turning up (which they did) the fighters could cross the River Blackwater and be over the county border into Surrey, and out of reach. Not that the constabulary were going to do much in the midst of a large bloodthirsty crowd. The fight that took place behind the Ship Inn on 17 April 1860 between the Irish-American John Heenan and the gypsy Tom Sayers was the first world championship fight. A bare-knuckle fight, it went into 37 rounds before the ropes were cut, the ring invaded, and the referee abandoned the fight. The fight went on for a further 5 rounds, a total of 2 hours 20 minutes, before being declared a draw. Both contestants were awarded a championship belt. A crowd of 12,000 attended the illegal fight. Sayers was reported in The Times as continuing the fight with a broken arm. Tom Sayers (1826-1865), born in Brighton, only ever lost one fight in his boxing career. After the Farnborough fight, he and John Heenan became good friends. 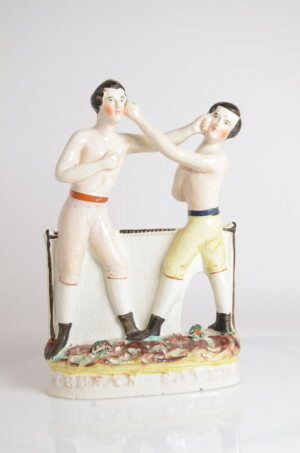 They toured the country putting on exhibition fights to commemorate their world championship fight in Farnborough. Sayers lies in Highgate Cemetery. The fight was the last of its kind. The nation was so shocked by the brutality of the fight that legislation was pushed through Parliament that put an end to bare-knuckle fighting.